Let me tell you about something cool! This is a sample entry, posted to show you some of the features of FlatPress. The more tag allows you to create a “jump” between an excerpt and the complete article. 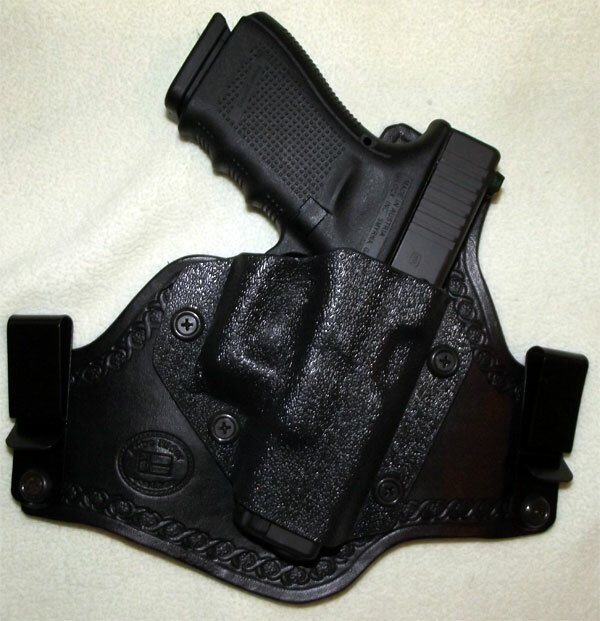 As any gun person (especially one who legally carries a concealed handgun) knows, it can be rather difficult to find a holster that meets all the typical points of desire. I recently received one of the first productions of a wonderful new concealable holster made by Jack Houston of Lone Rider Leather. While traditionally Lone Rider is a maker of fine Cowboy Action Shooting holsters, belts and accessories, he has recently expanded into making modern carry holsters. While many other styles are available and custom work is Jack’s specialty, the new Arm-A-Dillo line of hybrid (traditional leather with modern kydex) carry holsters are perfect for anyone who carries a concealed handgun for personal protection. 1. Comfort: With leather backing the holster conforms well to my hip. 2. Good Concealment: Worn inside the waistband (IWB) the gun is held in tight to the body to avoid “printing” and allows any light shirt to cover it completely. 3. Durable: Both the kydex and leather are good quality and very capable of standing up to years of wear. 4. Adjustment: Belt clips can be moved to adjust both ride height and cant (degree of tilt) of the gun. 5. Affordable: At $50 the Arm-A-Dillo is one of, if not the, cheapest tuckable hybrid around. I’ve got some used 1U rack mount servers to get rid of after they were retired from hosting company utilization. I’ll make sure that any server sold operates though I cannot guarantee that all hardware is functioning perfectly as these servers were in datacenter usage for 2+ years of constant running. Just contact me to let me know which you are interested in. Like most men, I have been throwing money away for a long time on cartridge based shavers like Mach 3, Fusion and others. While never being impressed, they have always been a good enough solution outside of the ridiculous cost of the cartridges. Every time I had to buy more I found myself thinking about just buying the cheap old single blade disposable “bics”. Instead I ended up getting a very nice Panasonic Wet/Dry Shaver, which while working great and including a nice automatic cleansing/charging base, I never really got into the habit of using it enough to acclimate my skin or facial hair so that it worked its best. During my most recent search for a solution, which started out as just searching for a cheaper way to order cartridges in bulk, I ran across many sources talking about the renewed interest in old fashioned shaving using either “straight” or “safety” razors. My interest piqued, I looked into some commonly suggested “safety” razors and started reading through comments on Amazon to see what people thought of them. 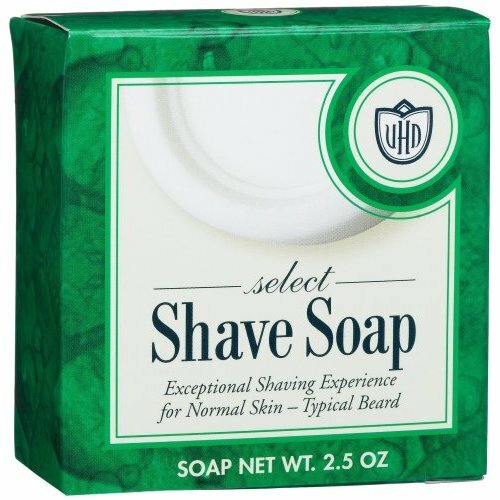 While I frankly don’t understand the name “safety” razor, as they seem fairly unsafe if you don’t take a slow and steady approach, the overall impression I developed was that men are very much enjoying the return to old ways. 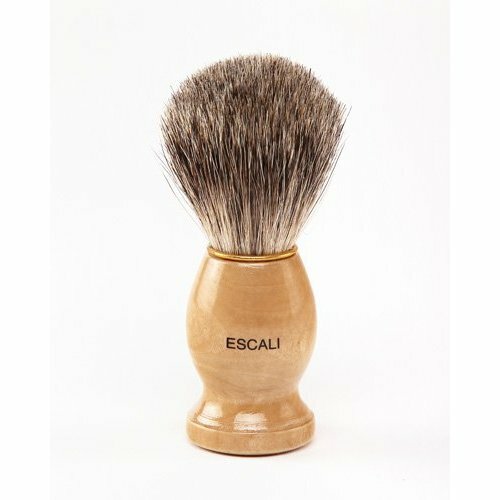 Many cite the comforting feel (and smell) of brushing on thick warm lather with a brush and the closer shave that is easily attained without having a plastic frame keeping the blade away from your skin. I spent hours digging around to find a good starting place as there are actually a daunting number of choices for someone completely new to this method. While I am sure I will find some better products over time as I try different things out, I managed to luck into a very satisfying setup which I’ll share with you now to hopefully make it easier for anyone interested in returning to a simpler, and just maybe more enjoyable shaving experience. The heart of any shaving kit of course has to be the razor (handle) itself. 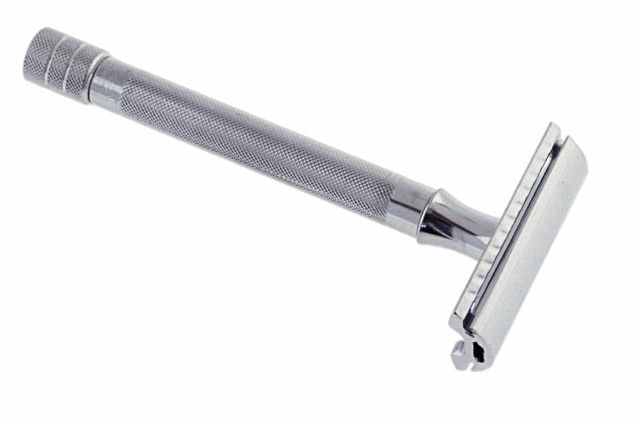 While many models from Merkur are highly rated, this long handled model is widely considered a great starter. Plenty of grip and easy manipulation make for easy maneuvering and the weight helps greatly to provide a good sense of balance to ensure that you keep the proper angle for a close shave. Second most important of course are the actual razor blades themselves. While there are quite a few different choices that sound good, only a few companies seem to have a great reputation for quality. 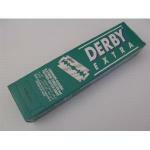 Derby blades seemed to be one of the highest recommended without getting into pricing that would make you rethink getting away from cartridges. Standard blades like this are a good choice for beginners particularly, while “feather” blades are popular for closest shaves with more experienced users. My initial thought was that soap is soap, so I wasn’t too concerned and was just planning to order the cheapest stuff I could find. After reading reviews I quickly realized that doing so would lead me to being less satisfied than I could easily be. This soap smells very nice though it is a subtle scent instead of seeming like a perfume. Just the nice smell of fresh soap. It lathers up quite easily without too much care for having just the right amount of water like some products I read about. I almost passed on buying a brush entirely and am so happy I decided to give it a try. Brushing on a good lather is really the nicest part of this return to old fashioned shaving. Not only does it feel very soothing, it also really helps to immerse you in the scent of the soap and get you into a nice relaxed mood to take your time for a nice shave. While many women love hot baths with candles and bath beads, this is how a man can get right with himself. One caution though is that these badger hair brushes can hold an amazing amount of water when you rinse them out. Make sure to keep this in mind when shaking out the water like a paintbrush and aim into the sink. Unless of course you have small kids who will find it nearly as enjoyable as you do when you splatter them with it. For all of this as a total package cost of around $80 it might sound like a fairly steep outlay to get started. I expect it will suffice easily for 6 months or more of shaving daily or near about. For a similar time period in cartridges, the cost would be approximately the same or worse. Going forward though will require only more blades and soap for a continued cost of maybe $20-50 per year. I’ll likely be trying out a few additional soaps and maybe even a sample pack of different blades in the not too distant future so as to have something to compare in deciding what works best for me. Next on my list however is a razor and brush stand along with a lather cup or bowl. Hopefully I can find a stand and bowl combo that is to my liking. My initial impression is that not only is it a better shave, old fashioned shaving provides a nice relaxing time of comfort to what most usually consider a hectic time of getting ready. The scent and sensation of lathering up some nice smelling cream (I’m looking forward to trying out sandalwood soon) and brushing it on is quite different than slapping on some barely lathered gel from a can and spreading it around with your hand. While it is certainly a good idea to take your time while getting use to this method of shaving, I would suggest enjoying the experience and taking your time (whenever possible at least) even after getting it down well. Most of us are rushed enough throughout the day so having a little time to just go slow and relax is probably a good idea and something we have more than earned. For anyone who watches Top Shot on History Channel, particularly Season 3 which just ended, you might like some of these great targets for your next trip to the shooting range. 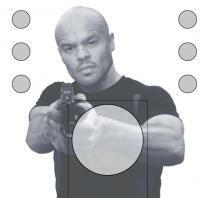 Sold by the company of Mike Hughes, who was one of the great competitors on “Season 3”, you can purchase true “bad guy” targets depicting the ultimate “bad guy” example from the show: Jake Zweig! No affiliate commission for me, just a great concept for anyone who is a fan of Top Shot and not a fan of Jake!